What statewide network services does ASA provide? 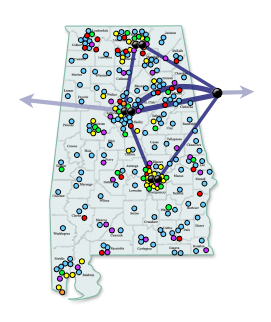 The AREN backbone, linking the state from Huntsville to Mobile, is comprised of segments. Internet access is provided to the connection in Huntsville, Birmingham, Montgomery, and Mobile. Our network is monitored and managed 24 hours a day, seven days a week, from our network operations center located at the Alabama Supercomputer Center in Huntsville. What is included in typical AREN service? How do we get a quote for our school system? If your organization is interested in learning more about the Alabama Research and Education Network, please have your Technology Coordinator, superintendent or designated officer send a written request on official letterhead to our business office. ASA staff will discuss your network needs with your local staff and will complete a technical review and needs assessment at no charge. This information will be used to prepare a quote for network connectivity. Why does ASA/AREN have two names? The Alabama Supercomputer Authority (ASA) is the governing agency created in 1989 and funded by the Alabama Legislature. ASA manages two primary projects: the Alabama Supercomputer Center (ASC) in Huntsville and the Alabama Research and Education Network (AREN), which was formerly known as the Alabama Supercomputer Network (ASN). ASA's Board of Directors voted to change the name of our network to Alabama Research and Education Network in 1995 to better reflect our service to the state's education community.